Solving world problems, because someobody has to. I can tell I’m getting older because I’m constantly shocked at how much things cost. A few years ago, I noted that just about everything was about ten times what it was when I was growing up. Now everything has crept up to about twelve to fifteen times as much. When I was in elementary school in the 1950s, candy bars cost a nickel, and so did Cokes, and ice cream cones and comic books were a dime. A chili dog was fourteen cents. Gas was thirty cents a gallon. Paperback books cost thirty-five cents. When I was in junior high in the early sixties, I had a paper route. My profit on a daily paper was a penny and half, but I really made out big on Sunday because I made four and a half cents on every paper. I had about forty customers. I could make a little over five dollars a week if nobody stiffed me on their paper bill. After I was old enough to drive, I got a job in the summers as an ice cream man. 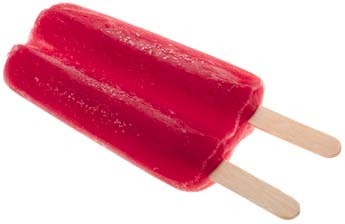 We had two classes of products, the basic cheap ones like popsicles, ice cream bars and fudgesicles went for six cents and I made a penny profit, and the deluxe items like ice cream sandwiches, drumsticks and sundaes were twelve cents and I made two cents. On a good day, working ten to twelve hours, I could sell maybe seventy dollars worth of ice cream and make fourteen dollars profit, less what I spent on lunch and what ice cream treats I ate. In high school, I usually ate lunch at McDonald’s. 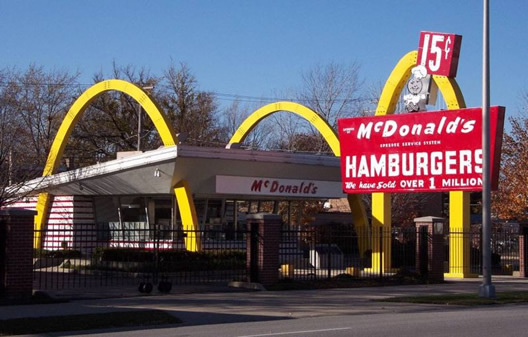 My standard lunch was two hamburgers at fifteen cents each, fries for twelve cents and a Coke for a dime. State sales tax was two percent. Total lunch cost, fifty-three cents. Those prices sound almost unbelievable now, but wages also were low. My dad was a floor sander and finisher. He charged nine cents a square foot to finish new hardwood floors and that included two coats of finish. It took two days to sand and finish a house, and he charged about ninety dollars. Of course he had to buy all the materials to do the job out of that. The same work today would probably cost about two dollars a square foot. My first job, other than helping my dad sand floors, was in 1964 working at a Woolworth’s in the evening sweeping and moping the place clean and taking out the trash. I made a dollar and a quarter an hour. There was a girl who worked in the soda fountain I liked. When she quit, on her last day, I decided to impress her by leaving a big tip. I left her a silver dollar. She still turned me down when I asked her out. My first car cost $75. It was a 1952 black Ford sedan. My dad went with me to the bank and co-signed a loan for $125, borrowing extra so I’d have money to get auto insurance. My next car was nicer, a 1958 Chevy that was only five years old when I bought it for $500. 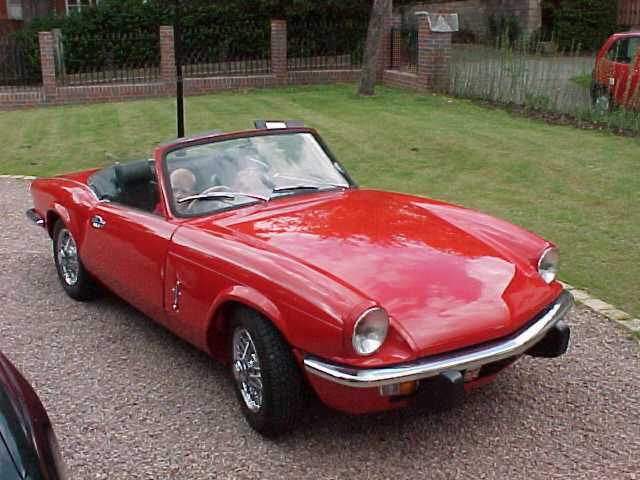 I drove it for two years, wrecked it twice, and traded it in for $500 on a new 1965 red Triumph Spitfire convertible. After my trade-in, I owed $1,100 and was driving a brand new sports car. I remember when I was in college in 1965 I was working part-time at a city library making eighty dollars a month. I got paid once a month. One month I foolishly ran though nearly all my pay with about ten days left. 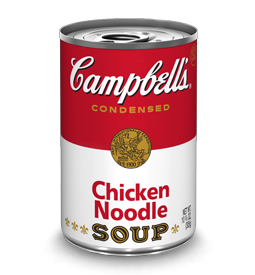 I only had a few dollars to make it to the first of the next month, so I went to the grocery store and bought a bunch of cans of Campbell’s soups, which at the time cost about fifteen cents a can, and a box of saltines. I’d set a can on the radiator in my dorm room to heat it up some, and then mix it up with hot tap water. I made it through the rest of the month on a solid diet of soup and crackers. Once in the early seventies, after I’d bombed out of college, a guy I was working with was quitting and moving out of town and he asked me to come over and help him load up. I went over on a Saturday and worked several hours getting him packed up. At the end of the day, he offered to sale me his 1958 VW bug and a metal jon boat. All I had to my name was sixty dollars. I bought the car and boat for sixty dollars. The VW was dead, but after I put some gas in it, and gave it a jump, it started and ran. Wish I still had it. The boat I later sold at a yard sale for fifty dollars. In the seventies, cable TV became available. It cost seven dollars a month at the start. Now we spent well over a hundred a month on cable and lots of nights we can’t find anything to watch. I was married and had two kids by then, and we were renting a two-bedroom house for eighty-one dollars a month. But it doesn’t always work that way. Sometimes, weirdly, things don’t go up, they go way down. Instead of inflating, they deflate. In 1984, I hungered for one of the new VCRs. I ended up spending about $1,500 for a Sony Betamax. I see VCRs at yard sales all the time now for five dollars, and nobody wants them The same thing happened with CD players and then DVD players. 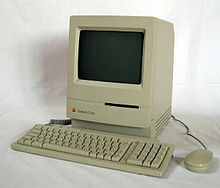 In the early 90s, I longed to have my own home computer and spent about $1,600 on an Apple Mac Classic with a tiny black and white screen and a printer. Microwave ovens cost about six to eight hundred dollars when they first came out. Now they’re a tenth of that. My brother had a digital camera before I did. He bought a Sony Mavica for seven or eight hundred. You can buy a digital camera now for thirty dollars that’s far better than the Mavica. Inflation isn’t gong away. I have a three and a half month old grandson named Kade. I can easily imagine Kade earning two thousand dollars a day when he grows up, and driving a car that costs a half million. He’ll live in a modest three million dollar house and spend five hundred dollars going out to dinner with his family. And when he gets old, he’ll probably be writing about how cheap things were when he was growing up.